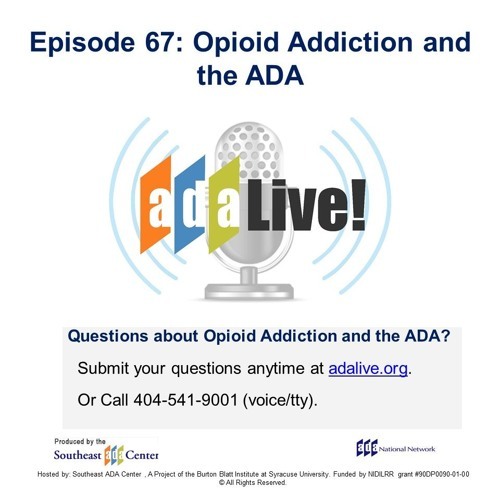 Episode 67: Opioid Addiction and the ADA by ADALive! For Additional information and transcript visit www.adalive.org/episode67 Every day, more than 130 people in the United States die after overdosing on opioids. The misuse of and addiction to opioids, including prescription pain relievers, heroin, and synthetic opioids such as fentanyl, is a serious national crisis that affects public health as well as social and economic welfare. In the next two episodes of ADA Live!, we will explore the opioid crisis from a number of different angles -- from treatment to the protections offered by the Americans with Disabilities Act (ADA), and from the justice system to legal and responsible use of opioids to treat chronic pain. In the first episode of this series, will focus on the treatment for opioid addiction and the protections under the ADA. Rebecca Williams, technical specialist of the Southeast ADA Center, will discuss the protections that people in treatment have under the ADA. Mike Yow & clinical staff of Fellowship Hall, will discuss the treatment approach Fellowship Hall uses, applying the Narcotics Anonymous principles and steps. This approach is often considered by professionals in the field of addiction as “the grandfather of treatment.” Fellowship Hall is a private, not-for-profit facility in North Carolina treating adult men and women with substance use disorder. Fellowship Hall has also earned the reputation of being a center of teaching excellence. Loving this info! My sister is in recovery, and has exercised her rights under the ADA for accommodations at work, it's been so empowering for her. I'm curious, on the Fellowship Hall website "Criteria for Admissions" page, I see "Be able to take care of his/her own physical needs" as a requirement, and it was mentioned earlier, being ambulatory. What does the accessibility of recovery centers look like for people with physical disabilities? More significant physical disabilities? A more significant Intellectual disability? If understood correctly, Title 3 would cover this. Does this extend to sober living houses as well? Are we missing populations of people to provide solutions and access to recovery due to inaccessibility?